‘Welsh Poppy’ is a special Autumnal collection by Clogau in partnership with HTW Support, helping Veterans and their families. Welsh gold jewellery brand Clogau have produced a pretty capsule collection for Autumn in collaboration with HTW Support, a charity set up to assist army veterans and their families. Happily gracing the rocky gardens of Wales, the bright and delicate Welsh Poppy has provided the inspiration for the new collection. 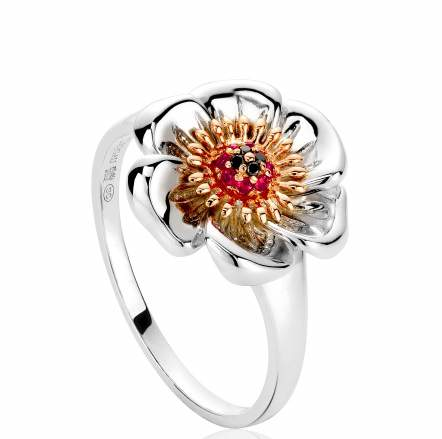 Each piece captures the beauty of the iconic flower with its elegantly curved petals, sparkling black diamonds, rubies, and glowing rose gold containing rare Welsh gold. Launching online and in store Friday 25th September 2015, the capsule collection provides an emblem of rememberance, dedication and appreciation for those who sacrifice themselves for the lives of the ones they love. Clogau are proud to support the Welsh charity, HTW Support who assist veterans to cope with life after the forces and helping families across Wales with emotional support as well as practical support. £10 from each Clogau Welsh Poppy piece sold will be donated to HTW Support.